If you treat police officers with respect, they will do the same to you. Police officers are people, too. By far and large, most are good people and they're not out to get you. ~ Steven Hildreth, Jr.
Law enforcement in the United States is one of three major components of the criminal justice system of the United States of America, along with courts and corrections. Although each component operates semi-independently, the three collectively form a chain leading from investigation of suspected criminal activity to administration of criminal punishment. Also, courts are vested with the power to make legal determinations regarding the conduct of the other two components. If even the earliest attempts at centralized police forces would have alarmed the founders, today's policing would have terriﬁed them. Today in America SWAT teams violently smash into private homes more than 100 times per day. The vast majority of these raids are to enforce laws against consensual crimes. In many cities, police departments have given up the traditional blue uniforms for 'battle dress uniforms' modeled after soldier attire. Police departments across the country now sport armored personnel carriers designed for use on a battleﬁeld. Some have helicopters, tanks and Humvees. They carry military-grade weapons. Most of this equipment comes from the military itself. Many SWAT teams today are trained by current and former personnel from special forces units like the Navy SEALs or Army Rangers... At the time the Third Amendment was ratified, the images and memories of British troops in Boston and other cities were still fresh, and the clashes with colonists that drew the country into war still evoked strong emotions. What we might call the 'symbolic Third Amendment' wasn't just a prohibition on peacetime quartering, but a more robust expression of the threat that standing armies pose to free societies. It represented a long-standing, deeply ingrained resistance to armies patrolling American streets and policing American communities. How did we get here? How did we evolve from a country whose founding statesmen were adamant about the dangers of armed, standing government forces–a country that enshrined the Fourth Amendment in the Bill of Rights and revered and protected the age-old notion that the home is a place of privacy and sanctuary–to a country where it has become acceptable for armed government agents dressed in battle garb to storm private homes in the middle of the night–not to apprehend violent fugitives or thwart terrorist attacks, but to enforce laws against nonviolent, consensual activities? How did a country pushed into a revolution by protest and political speech become one where protests are met with ﬂash grenades, pepper spray and platoons of riot teams dressed like RoboCops? How did we go from a system in which laws were enforced by the citizens–often with non-coercive methods–to one in which order is preserved by armed government agents too often conditioned to see streets and neighborhoods as battleﬁelds and the citizens they serve as the enemy? Radley Balko, "How did America’s police become a military force on the streets?" (1 July 2013), American Bar Association Journal. Too many of our citizens have cause to doubt our nation’s justice when the law points a finger of suspicion at groups, instead of individuals. All our citizens are created equal and must be treated equally... A strong America is the world's best hope for peace and freedom. Yet the cause of freedom rests on more than our ability to defend ourselves and our allies. Freedom is exported every day, as we ship goods and products that improve the lives of millions of people. Free trade brings greater political and personal freedom. Every officer has accepted a calling that sets them apart. Most of us imagine, if the moment called for it, that we would risk our lives to protect a spouse or a child. 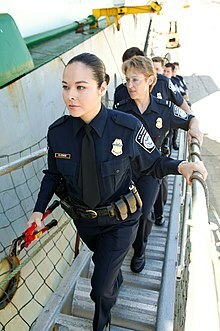 Those wearing the uniform assume that risk for the safety of strangers. They and their families share the unspoken knowledge that each new day can bring new dangers. But none of us were prepared – or could be prepared – for an ambush by hatred and malice. The shock of this evil still has not faded. At times, it seems like the forces pulling us apart are stronger than the forces binding us together. Argument turns too easily into animosity. Disagreement escalates too quickly into dehumanization. Too often we judge other groups by their worst examples, while judging ourselves by our best intentions. And this has strained our bonds of understanding and common purpose. But Americans, I think, have a great advantage. To renew our unity, we only need to remember our values. We have never been held together by blood or background. We are bound by things of the spirit – by shared commitments to common ideals. We are pretty free in America when you compare us to other nations around the world, but we're not pretty free in America when you compare us to past generations... I chronicle easily a hundred different cases where government has overreached and encroached on Constitutional liberties of Americans. We're at the point now in America, a little girl can't run a lemonade stand in her driveway without having the local zoning zealots come in and fine her fifty dollars. We're at the point now where elementary school kids down in Georgia have their irises scanned as they board the bus, all in the name of 'safety'. We're at the point now where nebulous environmental laws prevent homeowners from building a shed in their own back yard because there might be a flood plain issue in a hundred years. This is the America where we're at. Cheryl Chumley, interview with John Stossel, Stossel (21 August 2014), 9:08–9:09 p.m. (EST). America isn't easy. America takes work. Today, February 12, is Abraham Lincoln's birthday. He spoke at Gettysburg about a 'new birth of freedom' because we spent the first four score and seven years of our history with fellow Americans held as slaves. President Healy, his siblings, and his mother among them. We have spent the 150 years since Lincoln spoke making great progress, but along the way treating a whole lot of people of color poorly. And law enforcement was often part of that poor treatment. That's our inheritance as law enforcement and it is not all in the distant past. Serious debates are taking place about how law enforcement personnel relate to the communities they serve, about the appropriate use of force, and about real and perceived biases, both within and outside of law enforcement. These are important debates. Every American should feel free to express an informed opinion—to protest peacefully, to convey frustration and even anger in a constructive way. That’s what makes our democracy great. Those conversations—as bumpy and uncomfortable as they can be—help us understand different perspectives, and better serve our communities. Of course, these are only conversations in the true sense of that word if we are willing not only to talk, but to listen, too. Let me start by sharing some of my own hard truths. First, all of us in law enforcement must be honest enough to acknowledge that much of our history is not pretty. At many points in American history, law enforcement enforced the status quo, a status quo that was often brutally unfair to disfavored groups. It was unfair to the Healy siblings and to countless others like them. It was unfair to too many people. The Irish had tough times, but little compares to the experience on our soil of black Americans. That experience should be part of every American’s consciousness, and law enforcement’s role in that experience—including in recent times—must be remembered. It is our cultural inheritance. James Comey, "Hard Truths: Law Enforcement and Racism" (12 February 2015), Georgetown University, Washington, D.C.
Ted Cruz, as quoted in "Ted Cruz blames Obama for death of Harris County sheriff's deputy", by Matt Levin, Houston Chronicle (31 August 2015). Oftentimes helping others means putting your own life at risk if you are a law enforcement professional. The chances of an innocent black man being gunned down by racist cops are vanishingly small. And that is good news indeed... Black Americans will be taught to hate and fear law enforcement, fed on a steady diet of lies about their own country. America is a better place than they’ve been led to believe. Radical racial politics will only make it worse. David A. French, "The Numbers Are in: Black Lives Matter Is Wrong about Police" (29 December 2015), National Review. I'm a black man wearing a hoodie and strapped. According to certain social movements, I shouldn’t be alive right now because the police are allegedly out to kill minorities. Maybe, just maybe, that notion is bunk. Maybe if you treat police officers with respect, they will do the same to you. Police officers are people, too. By far and large, most are good people and they're not out to get you. Steven Hildreth, Jr., Facebook (27 October 2015), as quoted in "Man’s Facebook post about traffic stop goes viral" (29 October 2015), Tribune Media Wire. Bad boys, bad boys! What are you going to do? What are you going to do, when they come for you? Once they see that you don't have to bribe the police here, they're satisfied. Martin Luther King, Jr., "I Have A Dream" speech, delivered August 28, 1963, at the Lincoln Memorial, Washington D.C. It is an open secret long shared by prosecutors, defense lawyers and judges that perjury is widespread among law enforcement officers. Oh, no! Look in the mirror! It's a five-oh! I shouldn't have smoked so much weed, I shouldn't have done so much blow. All suspects are innocent until proven guilty, in a court of law. There's a lot of dealings with police officers right now. I don’t think all cops are bad. You know, I think there’s some great cops out there, who do everything in their power to uphold the badge and uphold the honor and protect the people in society. But there are bad cops, and I think that also needs to be addressed. I think the police officers we have right now, you know, some of it is being brought to light, because of video cameras, everybody has a camera phone. But these are things a lot of us have dealt with our whole lives. And I think right now is a perfect time to deal with it. The climate we're in, everybody's being more accepting, you know, so I think the ignorance should stop. I think people realize that, at the end of the day, we're all human beings. So, you know, before we're black, white, Asian, Polynesian, Latino. We're humans. So, it's up to us to stop it. We do want and will have a just obedience to the laws of the United States. That we will have. William Tecumseh Sherman, letter to the members of the city council of the City of Atlanta (12 September 1864). In a world where young blacks, especially, are bombarded with claims that they are being unfairly targeted by police, and where a general attitude of belligerence is being promoted literally in word and song, it is hard not to wonder whether some people's responses to policemen do not have something to do with the policemen's responses to them. Neither the police nor people in any other occupation always do what is right but automatic belligerence is not the answer. Thomas Sowell, "Driving While Black" (31 October 2007), Jewish World Review. We are trying to help; we are trying to help reduce the violence in Baltimore city. It is a hard, hard game. Hard game. People get hurt who shouldn't, all the time. Citizens, police, family members, everybody. Okay? Even somebody who may be doing something wrong, that's petty, ends up getting hurt beyond a scope that shouldn't ever happen. ... If we didn't care, we wouldn't come out in the street every day. Charles A. Thompson, Baltimorean police lieutenant, as quoted in Baltimore – April 25, 2015 (25 April 2015), by Dan Crapanzano. Avoid the necessity of those overgrown military establishments, which, under any form of government, are inauspicious to liberty, and which are to be regarded as particularly hostile to republican liberty. A hundred years ago they used to put on a white sheet and use a bloodhound against Negroes. Today they've taken off the white sheet and put on police uniforms, they've traded in the bloodhounds for police dogs, and they're still doing the same thing.